With a plasma cutter, you can cut through electrically conductive materials such as stainless steel and aluminum. This is thanks to an ionized gas called plasma which is applied to the materials at over 20,000 degrees Celsius. Useful across a wide range of applications, plasma cutters provide clean cuts with little in the way of debris. Now it’s time to take a look at our plasma cutter reviews! Here you’ll find out about the very best plasma cutters on the market. From features to pros and cons, you’ll soon have a much better idea of what you’re looking for! Following this, be sure to read our buying guide which goes in-depth into the various features to look for as well as tips for using a plasma cutter. When you need to cut steel, you need a plasma cutter. And what better than what we consider the best plasma cutter on the market? The Hobart 500566 AirForce 40i is a 40 amp plasma cutter which is able to cut up to 7/8-inch mild steel. It has a really nice ergonomic design that also happens to be lightweight. This is a powerful product with an inverter design that enables you to cut through aluminum, steel, stainless steel, and copper as well as other metals. The product comes with a variety of accessories including a hand-held torch and 10ft power cord with plug. Regarding the features of the Hobart AirForce, we can assure you that there are plenty to justify the price that you’re paying. A pilot arc controller allows for the cutting of expanded or perforated metals while wind tunnel technology prevents dust from getting to the internal components. Among other useful features include a cooling system and LED diagnostic lights. So many features mean that this is a great plasma cutter to use, with so many options available. This is definitely designed for heavy-duty use, however, it’s also the best plasma cutter for home use as of right now. For excellent versatility and portability, the Hypertherm 088016 Powermax 45 is definitely one to consider. Portability is down to the small size and light weight of just 37 lbs. This makes it ideal for anybody who lacks storage space or doesn’t want big, heavy equipment when going from site to site. This plasma cutter provides 45 amps of power which allows you to easily cut through metals of 1/2-inch at 20 inches per minute. You can save plenty of time buying a quality plasma cutter such as this since the higher gouge and cut quality means less edge preparation. We feel that using this plasma cutter is relatively straightforward with mode switch toggles conveniently letting you choose the correct operational mode. These include the continuous pilot arc, non-continuous pilot arc, and gouging. There’s also drag-cutting technology which makes things much easier for beginners in particular. It’s worth noting that this product also comes with a hand torch and work lead. Made in the USA, you can’t go far with this excellent all-round product though the hefty price tag may put this plasma cutter out of reach for some. It’s fair to say that some plasma cutters are very expensive and just not realistic purchases for many people. 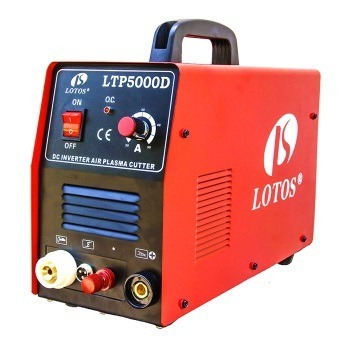 When this is the case, you’ll perhaps be interested in the Lotos LTP5000D which we feel is the best plasma cutter for the money. One of the main features of this plasma cutter is the pilot arc which makes cutting on rough and dirty surfaces much smoother and with minimal slag. This 50 amp product can cut up to 1/2-inch with a max severance of 3/4-inch and has dual voltage capacity of 110V and 220V. At just 26 lbs, this is a very lightweight plasma cutter and it has a good-sized handle for added portability. For this reason, we feel that this is a great choice for anyone who is looking for a smaller plasma cutter that can be transported and stored with ease. Beginners will like that it’s easy to set up as well as use and simply performs as advertised. One cause for concern is that some buyers found the customer service to be poor when issues arose. Also, there may be the additional cost of a pigtail if you want to use the plasma cutter on 110V. Otherwise, it’s hard to argue with the value provided. To conclude, this is simply the best plasma cutter under $500 right now. An entry-level plasma cutter, the Everlast SuperUltra 205 has a simple and streamlined designed that novices will particularly appreciate. 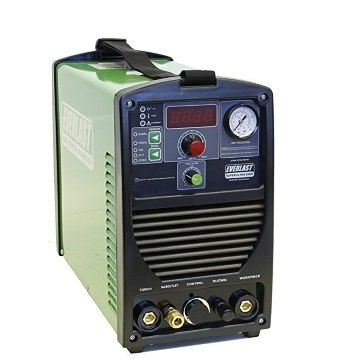 It offers up to 200 amps of welding power and is great for smaller welding projects that come up at a home workshop. It can cut through metal of up to 3/8-inch to 1/2-inch which should be enough for most smaller applications. If any problems should arise, you can always refer to the 3-year warranty that comes with this product. We particularly like the interface on the SuperUltra 205, which we feel is clear and easy to understand. Designed to be lightweight and portable, this is a fairly convenient plasma cutter, particularly when space is an issue. The design is quite nice too with the contrast between the green and black colors of the unit. A degree of flexibility is offered when cutting with the TIG, stick, and plasma cutting modes. While this plasma cutter does have a dual voltage feature of 120 and 240V, it’s only really suitable for light-duty work. While this product is generally considered to be easy to use, some people may find the included instructions fairly unhelpful. This is unlikely to cause much of a problem either way. To conclude, this is simply the best plasma cutter under $1000 right now. 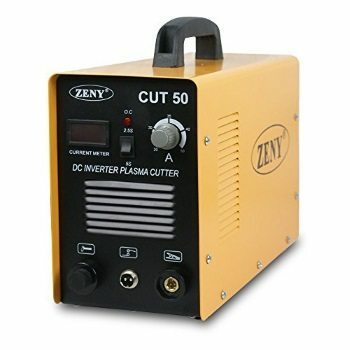 The Zeny DC Inverter Plasma Cutter may be a budget option but claims to offer the latest technology. We’re certainly impressed by the number of accessories included with the product, especially when you consider the low price. With it, you can expect to receive a cutting torch, earth clamp, air regulator, plasma tip, goggles and more! When you combine this with the great value, you can see why it’s such a popular product with hobbyists. You can see why this is for light-duty work when you consider the max cutting thickness of 1-12mm. One of the biggest reasons to opt for the Zeny DC plasma cutter is that it’s one of the lightest products on the market. It weighs just 22 lbs and it’s therefore extremely useful for anybody who wants a plasma cutter that is portable and storable. What’s more, the bright yellow design means that you’re unlikely to lose it! Aside from the low price tag, the consumables for this product are relatively cheap, helping to keep costs down. We think that this is another big selling point. While setup is easy enough, the instructions are said to be rather unhelpful so you may prefer to refer to forums or online instruction videos. While it’s all well and good knowing about the best plasma cutters on the market, it’s only truly useful when paired with information on specific features and more! Our aim is to provide you with all of the essential information so that you can reach an informed decision quicker and easier. Plasma cutter technology has advanced a great deal over the years. One of the benefits of this is that the machines have become much smaller and lighter without compromising on power and performance. Most have a handle and you can even buy wheel kits and machine carts as means to move them around. Cutting through metal is all well and good but sometimes precision is required. Plasma cutters allow for a great deal of accuracy, particularly when measurements are made in advance of cutting. 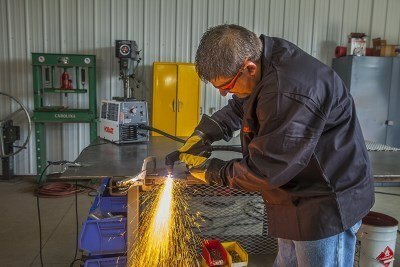 Consider a plasma cutting guide in order to get the best out of your machine. If time is short, a plasma cutter can be very useful indeed. The speed obviously depends on a few things such as the power of the machine as well as the type and thickness of the metal. 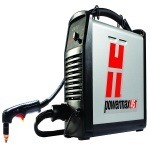 There are some seriously powerful plasma cutters on the market today and many are available at very reasonable prices. It’s not too difficult to learn how to use a plasma cutter. Furthermore, complicated adjustments aren’t required unlike with some laser cutters. As previously mentioned, they’re capable of cutting through metal very quickly indeed. For these reasons, plasma cutters are highly efficient. The fact that you can cut so many different metals with a plasma cutter makes it a very versatile tool indeed. Not only this, they can also get through metals of varying thickness. So whether you’re cutting through thick aluminum or thin steel, they can usually get the job done without issue. We’ll now explore the most important features to look for in your plasma cutter. Some of these are standard in all models while others are only available in certain units. Perhaps the most important feature to consider, the power of your plasma cutter really defines what you can and cannot do with a particular product. 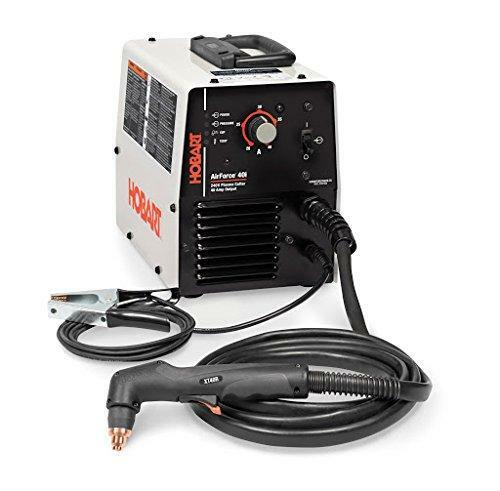 Plasma cutters are typically designed for 110V and 220V outlets. You should also look out for the amperage rating. It’s best to opt for more power than you think you’ll need as this is better than having too little. We also recommend having a circuit that is dedicated to the plasma cutter only. The duty cycle of a plasma cutter refers to how many minutes it can function at a certain amperage without overheating. You can usually find out the duty cycle of a product quite easily. If you think you’ll need for extended periods of time and don’t want to have to take too many breaks, we suggest you go for a plasma cutter with a higher duty cycle. Some plasma cutters have good cooling fans and thermal protection which can also help in this respect. When you’re looking at plasma cutters, you may notice that some have an inverter design. Those with built-in inverters tend to be more expensive because they are typically smaller and lighter. As such, they’re usually much more portable which might be important if you’re moving from site to site with your plasma cutter. Those with inverters can also overcome power fluctuations which make them more reliable than the standard plasma cutter. If you’re only using your plasma cutter in one place such as your home workshop, portability may not be important to you. However, if you’re using it for your business and moving from site to site, portability may become more of a factor. Plasma cutters are available in varying sizes and weights. 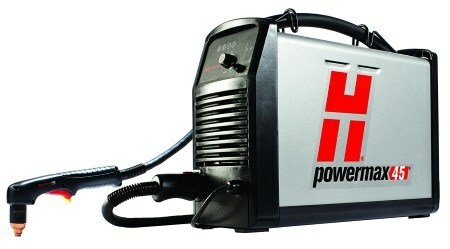 Inverter plasma cutters tend to be more portable though most products come with a handle to make transportation easier. Most of the best plasma cutters have a feature called pilot arc. This means that you can make a cut with the plasma cutter torch without the tip making contact with the metal. The advantages of this are that it provides a cleaner cut and saves on the consumables of your torch. It also makes cutting thicker metals much easier. Plasma cutters with pilot arc tend to be more expensive but are worth the additional investment. Machine Cart: The more powerful the plasma cutter, the bigger the equipment tends to be. A machine cart can help you move the plasma cutter around the workspace. Welding Table: While a machine cart lets you move your plasma cutter around, a welding table helps you keep materials in place. It’s stable and you can use it for measuring too. Head Protector: A head protector may sound like it’s for you, but it’s actually for the plasma cutter! It attaches to the head of the torch to protect from heat and molten metal. Wheel Kit: Another option for moving your plasma cutter around is a wheel kit. These are especially useful for larger, heavier plasma cutters that require some portability. Storage Kit: Many plasma cutters come with storage bags. The advantage of having some sort of storage kit is that you can have everything in one place. No more lost accessories. Plasma Cutting Guide: In order to align the cut and sure it is perfectly precise, a plasma cutting guide is highly recommended. It makes working with a plasma cutter much easier. We’ve told you all about the most important plasma cutter features as well as some of the accessories you can buy. It seems only sensible that we also provide a few safety tips for when you finally get your hands on this very practical tool. Always wear protective headgear and clothing. Headgear could be goggles (as a minimum) or a full welding mask. Clothing should be heat and fire resistant. Anyone else in the work area should do the same. Plasma cutters can produce an intensely bright light. This can harm your eyes if they’re not sufficiently protected. Maximum eye protection is offered by good-quality welding helmets that have auto darkening. Do not leave any skin exposed when using a plasma cutter. Make sure you wear long sleeves and trouser legs as well as the appropriate gloves. One area some people forget is around the neck. Try to keep this completely covered as well. 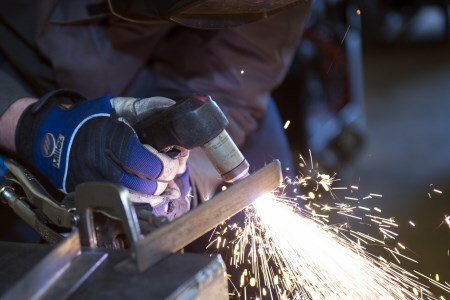 Gases produced by using a plasma cutter can be harmful to your health. For this reason, you should work in a well-ventilated area. An air-supplied respirator is a very good idea in order to avoid inhaling these gases. Because of the electricity a plasma cutter consumes, you should never work in an area that is wet. Check for moisture before working and stand on a rubber mat if you want to add an additional safety measure. As you’ll have no doubt gathered, a plasma cutter is a great option to have! There are so many advantages to this tool including quick and easy cutting of a variety of metals. The only problem is deciding which plasma cutter to buy. With so many products on the market, it’s little wonder that such a decision takes time and effort. Our reviews of plasma cutters are designed to make your decision quicker and easier. Be sure to refer to the various pros and cons as well as the buying guide’s list of features and accessories. These should help you narrow down the options and find a great product that you can be happy with for years to come!